If you ever wanted to make your Chrome browser freeze 10 times in one afternoon, you could take a look at the 1.4 GB of XML files of net neutrality comments that the Federal Communications Commission (FCC) posted on Tuesday. More than 1.1 million comments regarding net neutrality have been submitted to the FCC, and we expect that number to surge as the second comment period comes to a close on September 10. The only time the commission has seen more data was in response to Janet Jackson’s wardrobe malfunction in the 2004 Super Bowl. The FCC released five massive XML files that contained the comments. TechCrunch went through two — batches one and four — to sort the content of the missives by keyword to see if anything interesting cropped up. Our sample size — thousands and thousands and thousands of comments — shed light on the general bent of commenters’ main topics of interest: free speech, ISPs and anger. 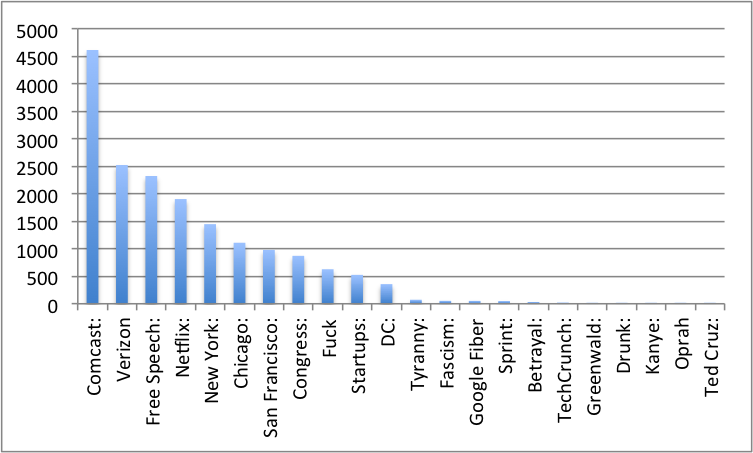 After summing our search results from the two files, the term ‘free speech’ racked up 2,322 mentions, beating out Netflix, which picked up 1,903. Comcast beat both with 4,613. Notes containing New York, Chicago, and San Francisco — each mostly sourced from the location of the comment submitter — came in at 1,447, 1,109, and 979 apiece. TechCrunch itself picked up 22 mentions, all from the first file. We beat out ‘Greenwald’ who picked up a slimmer nine mentions. Drunk, with five mentions, beat both Kanye and Oprah, who got a mere two apiece. Metallica was not mentioned, nor was Katy Perry.